Photomicrograph of a human "germinal vesicle" (embryologist’s techno-talk slang for an egg with a visible nucleus = germinal vesicle and no polar body on light microscopy). Human eggs in the prophase stage (initial stage) of meiosis I (the first of two nuclear divisions that occur within an egg to result in an egg that contains only half of the normal cellular number of chromosomes) have a visible nucleus (germinal vesicle) and have not yet extruded a polar body. 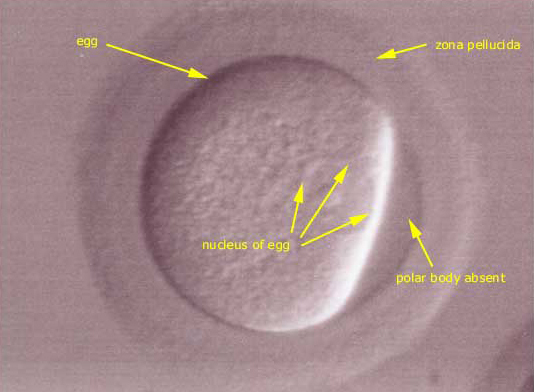 Eggs with a germinal vesicle without a polar body are considered immature (not yet fertilization capable) and (In Vitro Fertilization) embryologists will generally culture these eggs within the lab for a day (or so) to allow them to complete meiosis I. When meiosis I is completed the eggs can be seen to have a polar body (rounded mass) outside the plasma membrane but within the zona pellucida (shell) of the oocyte (egg).